Only about 10% of cassava raw material in the world are used for trade purposes directly. Major cassava products import countries include the United States, China, Japan and other countries. On the other hand, cassava processing is widely in the world. In addition to more than 65% used for direct consumption as food, the deep processing is mainly used in the starch production from cassava, then further processed into citric acid, lysine, glucose, fructose and other products. So the machine used for starch production from cassava is hot selling worldwide. Next form is the main machine used for starch production from cassava. Cassava cleaning usually adopt the two section process for starch production from cassava. Dry sieve can effectively remove dirt, sand and small stones, it has the ability to avoid sewage disposal. According to multiple spiral operation, paddle washing machine can remove silts and impurities from the surface of cassava. This section can be performed manually. The first starch production from cassava is able to clean the outer peel, at the same time the very superficial peel of cassava will be simply handled. 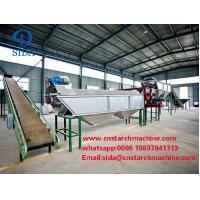 kaifeng sida Company advanced crushing machine rasper used for starch production from cassava can make the starch extraction rate reach to more than 95%. After cassava crushed by rasper, fully free the starch, get the starch slurry. 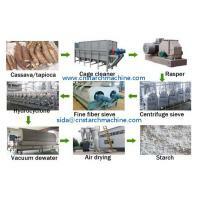 Centrifuge sieve is mainly used to separate the fiber from starch slurry. It is widely used in the starch produdction from cassava tubers. The sieve basket is made of titanium plate, with laser punching processing. There are some advantages of the machine: low power consumption, stable operation and high starch extraction rate. Thenn fine fiber sieve will be used in the further seperate section to get rid of fine fiber in starch slurry. This is the purify machine used for starch production from cassava, aimed to screening the insoluble impurities out. Disc separator is a highly efficient and advanced protein separation equipment, it can isolate about 80 percent of the protein at one time, after the second separation of starch milk can reach less than 0.5 percent of the protein content. Hydro cyclone station will remove fiber, protein and cell to further process starch milk. These two machines used for starch production from cassava can remove the soluble materials from starch milk. This procedure starch production from cassava is designed to improve the quality and purity of the finished products. After concentrating and purifying, the starch slurry water content stiil high, so need to dewatering by the vacuum filter to get the wet starch which moisture is under 40%, the adopt the flash dryer as the drying machine used for starch production from cassava, after this, get the final starch products with moisture content 12%-14%, meet the standard, then can be packed. 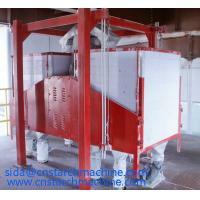 Above all, this is kaifeng sida Company machine and technology used for starch production from cassava introduction. In addition, the food industries are one of the largest consumers of starch and starch products. In addition, large quantities of starch are sold in the form of products sold in small packages for household cooking. Cassava, sago and other tropical starches were extensively used for food prior to the Second World War, but their volume declined owing to the disruption of world trade caused by the war. Attempts were made to develop waxy maize as a replacement for normal nonce real starches; but the production of cassava starch has increased considerably in recent years. The market of starch production from cassava is expanding and has enormous potential.